Wow I would be sew grateful to win! But good luck to all that enter. I like the green fabric and 3639 is one of my dream patterns. I'm with Dawn on this one. I love the green fabric and pattern 3659 (the cape). Thank you for hosting this! I love the pink fabric and the cape pattern! Thank you for having such a generous giveaway! I looove the pink fabric, it's gorgeous! I suspect if I don't win, I'll end up buying some anyway. And the 3730 is super cute too. Loverly fabric and patterns! I would love to put my try in for the pink and white Weaving Destination fabric and that gorgeous dress pattern! The front is so cool, i can't stop staring! Luckily nobody is actually in front of me wearing it. :) I will be posting and linking up my giveaway on Monday (tomorrow). Such great giveaways! I'm in love with the orange and brown fabric, and the McCall's dinner gown pattern. Finally a giveaway that is perfect for me! I love the mauve/orange stripe fabric, those are my colors! I also love the cape pattern! I used to have the most amazing black cape that got lost in moving, and I have been wanting to make a new one to replace it. This would be perfect! Oh, thank you for the opportunity to win one of those wonderful prizes! I would dream of either the mauve/purple and orange fabric to sew with or absolutely love the McCall dinner dress pattern 3730! Oh goodness! Those are great giveaway items! I like the mauve and orange fabric best. As much as I love the dinner dress pattern I would pick the cape pattern. I don't have anything like it. :) Thanks for the giveaway! Hi Debbie! You are very generous. I love the middle fabric - it looks brownish on my monitor but I think it is described as purples. I'll leave the patterns for someone who can really appreciate them. Have a lovely week - are the days getting longer now? I love the green pattern and the cape pattern. Thanks for the chance! Hgggnnnnn OMG THAT CAPE. 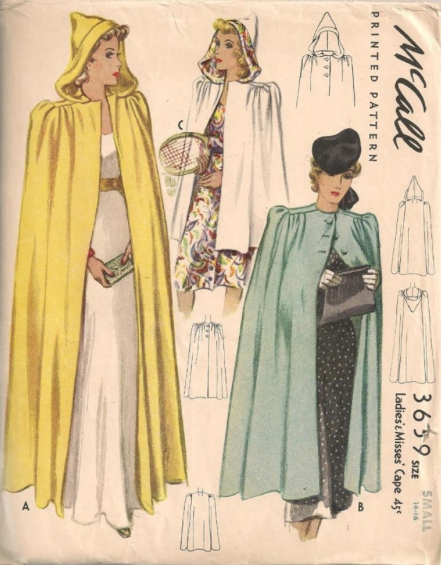 How did you KNOW I have been searching for 40s cape patterns lately? Want to win this so badly! Thank you for hosting the give away! I'd love the mauve fabric and the dress pattern! I like the green fabric and the cape pattern. Thank you for the generous giveaway! I really like the Deep Burgundy and gown pattern! Oooh! Exciting choices! I love the middle fabric - reds and burgundy and the cape pattern - thank-you so much for hosting this! I love the pink fabric and the Cape pattern. Lovely, giveaway; tough choices! I'd love the middle mauve/purple/orange fabric and secondly, the charming cape pattern. Thanks and happy sew grateful week! I love the pink fabric and the dinner gown. Thanks for the lovely giveaway. I love the green fabric and the dinner dress pattern is my favorite. I love the dinner dress pattern. Thank you for hosting this giveaway! Gosh, how lovely of you! I love the pink and white fabric, and the dress pattern! And I'm sure that lots of people are grateful for all that you do and share, like I am! I love the weaving destinations fabrics - what a lovely prize. I would go with the green striped fabric, and the cape pattern is adorable. Oye what a generous give-away! What a lovely giveaway :) I'd love the green fabric and the dress pattern is gorgeous. Oh, what a lovely give away! I would love to have the mauve/purple fabric and the misses' dinner dress pattern! Either pattern and pink fab...or no fabric both patterns. Your generosity has given us a dilemma! Thank you for this giveaway! If I won I would want the brown striped fabric and the evening dress pattern. Thanks for the giveaway. I adore the bright pink fabric and am cooing over the dress pattern. Oh sew beautiful! The cape patterns is amazing! and - The pink fabric! Wow such lovely fabrics!!! Can't yiu incision a wonderful cape in the green stripe!!! Oooo beautiful fabric! I love the green and am drooling over the dress pattern. Gorgeous! drooling over the green stripe fabric! Wow - such a great giveaway :) I've drooled over the mauve/purple and orange fabric ever since you made your dress - the yoke is fantastic! And I love the cape pattern - so chic. Thanks so much for the giveaway! Wow, that green fabric is incredible! And I love the dress pattern - all those gathers! Thank you for an awesome giveaway. Ooo, these are so beautiful! I'm going to be dreaming about that dress pattern! I honestly don't know which fabric is the nicest, they are all so dreamy! Possibly the green wins it, but a photo finish. A truely lovely giveaway! I would love the green fabric or the dress pattern. What a lovely giveaway! Oooh fab giveaway! The green fabric is gorgeous and the evening dress pattern is fab! The green fabric and the cape pattern! Thank you! Thanks so much for the giveaway! I would love the green fabric, and the cape pattern is great! Wow! What a fabulous giveaway! I would love some of the pink and white fabric. That cape pattern is pretty amazing too. Thanks for hosting such a lovely week! I am Sew Grateful to you! Thank you soo much for the giveaway! I love the pink and white fabric and the cape pattern looks so elegant. What a fantastic giveaway. I think the orange / purple fabric is great. I love the cape pattern too. Oh my goodness! What a generous giveaway and what a difficult choice! I think I like the pink fabric best. 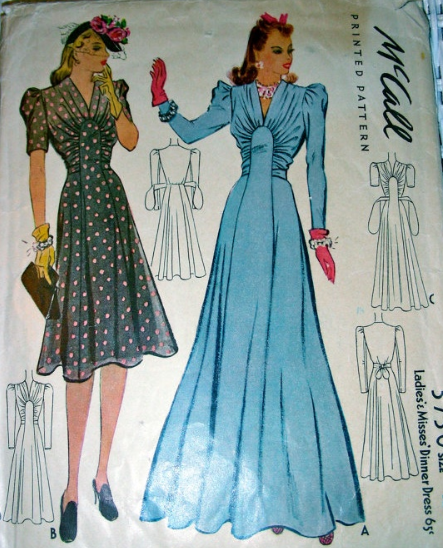 And I've just got a 1950s vintage cape pattern, so I'd go for the dress! Thank you so much for the wonderful giveaway, I love the pink fabric and the cape pattern is sumptuous and would look amazing in soft green velvet. If I don't win, this pattern is on my wish list, or I may try self drafting a copy. I love that green fabric and I'd love to make that dinner dress pattern. Such a great giveaway! I would choose the dress pattern and the purple striped fabric. Oh green and that gorgeous gown! The brown/ orange. The cape would be awesome!!!! I love the green fabric and would probably go with the dress pattern. What an awesome giveaway! I love the pink and white fabric and the gown pattern. Lovely giveaway Debi! I would love the green fabric and the cape pattern if I won! Thanks for hosting! The pink fabric, and the dinner gown! Looking forward to sew grateful week! Thanks so much for hosting this whole wonderful week! I'd love to win the pink fabric and either pattern would be a phenomenal addition to my collection! I love the green cotton fabric and Mc Call 3730! Thanks for the giveaway! Thank you for hosting the giveaway. I would like the pink fabric and the gown. Oh! The dinner gown makes me think so much of my grandma who passed away when I was in third grade. I'd love that pattern! And the fabrics are hard to choose from - I think I'd say pick, although they are all neck-and-neck. 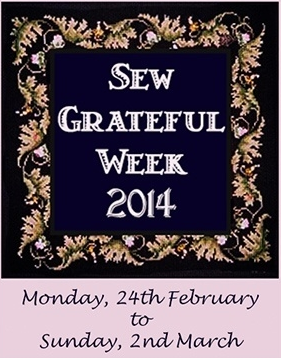 Thanks for the giveaway and the whole Sew Grateful Week idea - I am participating on my blog. Thank you for the giveaway, I really enjoy your events. I like the gown pattern and the pink fabric. Thanks for hosting such a great week! Thank you for your giveaway, i like red/brown fabric. Beautiful. I don't care about patterns, they are pretty and feminine, but not my style and doesn't suit my current lifestyle, I would happily pass them on for someone, who would really appreciate them. Wow, that brick red fabric would make a gorgeous skirt, and the dress pattern is beautiful!